Above images of the 3 of the 6 golden healers. Other 3 of 6 crystals pictured below. A group of 6 quality C grade natural golden healer quartz crystals. The mineral iron oxide gives quartz crystals their golden color. They are known in the metaphysical community as golden healers. The iron can be a thin or heavy external coating. As it's name suggests, it's used healing situations, both physical and spiritual. 8.5x6.5x5.5 mm / 1.57 ct. with great clarity, double termination tips and a key mark. 10x8x6.5 mm / 2.67 ct. raw quartz crystal with good color, excellent clarity and sharp double terminations. 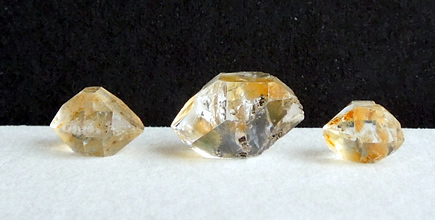 13.75x10.5x8.5 mm / 5.66 ct. is pale yellow, good clarity, a sharp point and a rainbow. 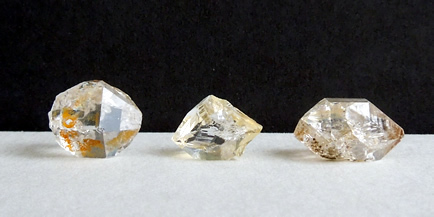 15.5x11.5x10.5 mm / 7.1 ct. is a hopper crystal as well, and includes a 3 mm bridge. Clarity is excellent. 15.5x13.5x11 mm / 13.5 ct. with excellent clarity, sharp point and round shape. 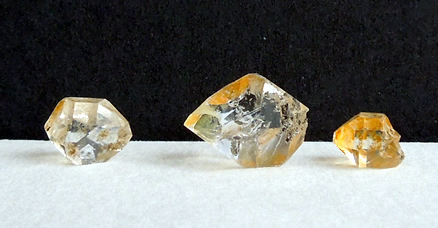 18.5x11x10 mm / 13.4 ct. is also a skeletal crystals, double terminated with rainbows. A beautiful group of natural pale yellow to darker orange golden healer metaphysical quartz crystals. Images below are of 3 of 6 natural golden healers.